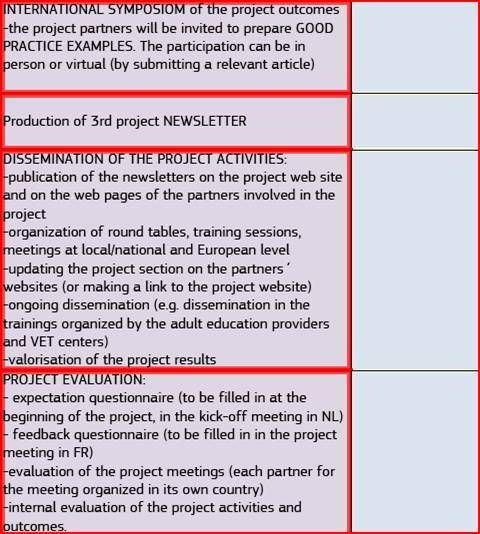 The objectives and activities of the project CO-BUS-VET address the teachers & students of economical subjects in VET schools and to trainers & trainees from VET providers. The learners from VET schools and EU labour market will develop an entrepreneurial attitude and way of thinking, which will allow them to find easier a place on the labour market (e.g. by starting their own business). In this respect, the project will encourage learners to set up their own virtual companies, getting involved in a real life situation in the labour market; additionally, they will actively use ICT to understand how an enterprise works. In the schools involved in the project, the entrepreneurship will be included in the VET didactic work, in order to improve and spread a new vision for the economic education for today, according to the curriculum and to the needs of actual economic crisis. In order to achieve all these, the partnership will use presentations, debates, workshops, class assistance and exchanges of good practices in business teaching, within VET education. The project outcomes are: project WEB SITE; project LOGO e-NEWSLETTERS; NETWORK of VIRTUAL TRAINING FIRMS (in the schools involved in the project); BUSINESS GLOSSARY; EXHIBITION with the poster proposals & the products of the virtual companies; DVD with ISBN; DIGITAL BOOKLET with comparative studies; GOOD PRACTICE EXAMPLES OF BUSINESS TEACHING&TRAINING METHODS. The main goal of CO-BUS-VET is to promote business education culture among our VET organizations, to help teachers/trainers become familiar to modern European methods of teaching economical subjects. -To promote the contact between generations, intercultural experience and exchange between partners and a better understanding and knowledge of the European linguistic, cultural and social environment. starting a firm according to each country legislation; marketing; financial management and the accounting mechanism; innovation and creativity in business and business communication. The teachers&trainers will improve the quality of their teaching, through the transfer of knowledge between partners, which will help them be more involved with the students they train, so that students rapidly enter the labor market or the business sector,for a fair and clean economic world. We will include Business Studies/Management/Marketing/Accounting/Finance Studies into the regular school curriculum of the schools involved in the project (e.g.Romanian and Latvian partners silent high schools and of the Turkish high school) and in-service training organized by the VET providers. The project meetings will be organized,in order to compare different economical teaching experiences. In this respect, the project meetings include: presentations; brainstorming sessions; round tables; lectures; workshops; Internet research; debates; demonstrative lessons in schools or /training courses for teachers; studies; questionnaires/survey; meeting evaluation; cultural activities. The project CO-BUS-VET is the result of all participants' involvement, so each organization will cooperate and interact with the others for the creation of the project outcomes; participation in the project meetings and in the evaluation and dissemination process; creating a project section on their websites; making the reports for their NAs. At the beginning and at the end of project we'll fill in questionnaires and will make surveys, in order to measure the project progress. Three times in the 2 year period an e-newsletter will be published. RO: coordination the dissemination; initiation of the google discussion group; presentation "Training firms method"; network initiation; organization the INTERNATIONAL SYMPOSIOM in RO (June 2015); publishing the DVD with ISBN. 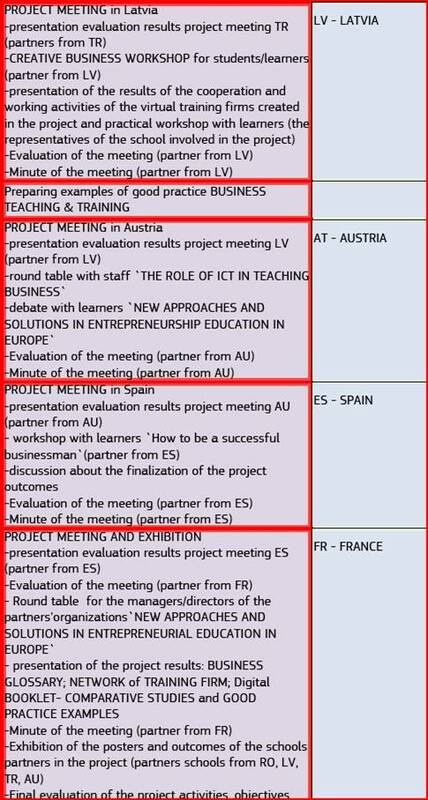 AU: PROJECT MEETING (Nov.2014); debate "`PERSONAL AND PROFESSIONAL QUALITIES OF A SUCCESSFUL BUSINESSMAN"
FR: PROJECT MEETING and EXHIBITION (June 2015); round table for the managers/ directors of the partners' organizations NEW APPROACHES AND SOLUTIONS IN ENTREPRENEURIAL EDUCATION IN EUROPE`. Additionally, each VET schools will initiate a project corner, will create VIRTUAL TRAINING FIRMS in the school, will be part of the virtual network and will take part in the contest for the creation of the project POSTER. The project will represent a major opportunity of lifelong learning for all teachers / trainers involved in the partnership, and all of them will all learn something from each other, because they come from very different areas each of them, not only geographically but also business teaching and training. The partnership will represent an effective cooperation based on honesty and active involvement, because all partners will have to share to the other colleagues their own experience of teaching business. The project coordinator must pay attention at all times and to inform all other organizations whenever a new topic appears. Each partner organization will organize a project meeting and/or will take part in a meeting organizes by the other project partners and will achieve the synergy among the participants in all the activities that they will coordinate. These "face-to-face" project meetings should be the main way of communication for the team, with the aim to strength the cooperation of the partnership and to update everyone with the news and the use in teaching business. Before each meeting, the host organization of the next project meeting will announce the meetings' agenda, per day, activities, will organize the logistics (accommodation, meals, local travel) and at the end of the meeting will make the minute in which to record all events, decisions and conclusions. The managers of VET high schools and VET provider organizations will be able to exchange best practices in business education' management, to improve the attitude and quality of social atmosphere of their organizations. English will be the communication language of the project. The Internet will be mainly used for communication through regular e-mail, by initiating a discussion group in which all partners will participate, and Internet will be used for conferences between meetings (e.g. Skype /Yahoo). The electronic communications will be used for project meetings and ICT technology will be used for the all digital products. Another mean of communication both within the project and outside, will be the Newsletter, which will present the general nformation about project achievements and actions. And finally, another way of communication will be web pages / web site of the partners/ project. We will not give up, obviously, the traditional modes of communication - telephone, fax or regular mail, to eventually improve the quality of messages. All institutions in the project are in different contexts involved in training activities (initial or continuous). They deal with the target group of students and young people (a big part of them being unemployed). Although the project is mainly aimed at teachers&trainers to improve their economy and business teaching methods, and only as a consequence will address the subjects of learning (students/trainees), the learners will be involved in all phases of the project, since at first, in all planning, implementation and evaluation for the entire period of the partnership. In the CO-BUS-VET the partners will have specific tasks, depending on their profile, but they will perform also common tasks (see F1). If possible, organizations will organize demo training courses for teachers and trainers specific in order to improve business delivery (e.g. 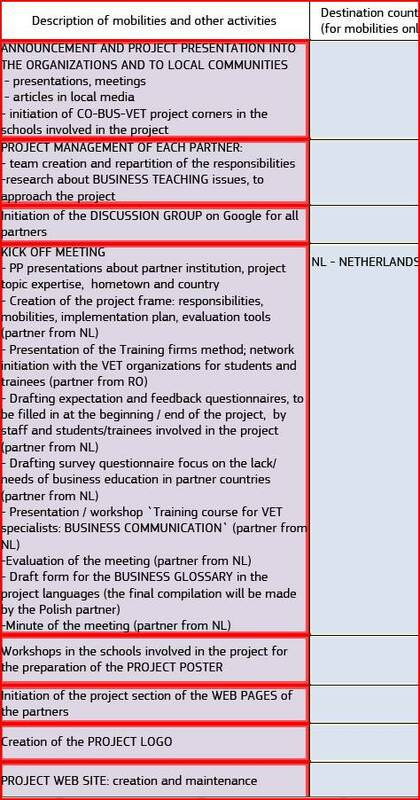 the Dutch partner intents to prepare and provide a course "Business communication" for teachers and trainers in VET, focused on the issues of entrepreneurial education). Teachers&trainers will have a dual role in the project: as counsellors for their students&trainees, but also as learners who wish to learn more and become more successful in teaching economics and business. Teachers will participate in courses and project meeting, will contribute to the project through the exchange of knowledge and best practices and will be the ambassadors of their institutions for the other European partners. All participating staff of the partner institutions are already directly involved into project planning and development. After the kick-off meeting, the relevant staff will organize focused workshops on detailed project planning, sharing concrete tasks for activities - implementation, communication, dissemination, monitoring and evaluation. Evaluation and expectations questionnaires will be completed during the project so teachers&trainers and their students&trainees will be able to assess the quality of partnership and of the project outcomes. The most experienced partners in European projects will advise the new ones, in order to avoid problems or conflicts. A possible result of this partnership will be to deepen the project work and issues by applying for a new project in the "Erasmus for all", to be able to transfer results and develop targeted strategies for the involvement of Entrepreneurial Education in different institutions of Vocational Education and Training in Europe. Students&trainees of our direct or silent partners, will be involved in completing questionnaires, evaluation sheets and in developing learning activities by virtual training firms, which will be effectively included in the curriculum. The training firms will be established and will work directly on being lead by students; the students will organize the virtual companies in functional compartmentslike real companies; will choose to work in departments, but over a year, in rotation, will work in all compartments; will have the opportunity to see what they like more to do and what suits them for a better career decision. The students will be responsible and accountable,they will learn to calculate economic indicators,to identify sources of business financing,to acquire awareness of market and product,to establish the correct professional relationships, to prepare accounting documents under the laws of his country and to build their own entrepreneurial skills. All theoretical notions will be within the classes of Management, Finance,Marketing,Accounting concepts that will enhance in the virtual transactions of their firms. In all virtual training firms, the students will participate in workshops for creativity and innovation,that will further prepare them for the business' world. Following the exchange of best practices in the project,teachers&trainers will reinvent themselves and will seek the most effective methods of education and training of their students,the presentation of the business world as an intelligible and understandable mechanism to be taught especially practical and less theoretical. Teachers will present their curricula more attractively,interactive,by stimulating their student’s entrepreneurial skills,communication, team work, socializing and behavior in a competitive business environment. In the same time, the partners will raise awareness towards the issues within their institutions and encourage their teachers and trainers to use innovative methods and to promote entrepreneurship in their everyday training activities,as a solution for a better integration of the young people on the labour market. Project outcomes,methods and materials will be made achievable for all staff members (website) and can easily be adapted in the every day activities of each organization. Some of the approaches can be used without any special strategy,simply by using some of the project’s methods,results and findings in own training measures. Project evaluation will help to the achievement of coherence and will be done once the project activities start and will finish when the project ends, after the last activity. Each partner will appoint a team made up both of teachers/trainers & students/trainees and/or managers, who will analyze the assessment, after each activity, will monitor the progress of the project, noting whether the actions taken and the actions planned coincides, and whether the project objectives are met. The teachers&trainers involved in the project will regularly assess the activities and the skills,knowledge,competences, abilities,attitudes their learners have gathered. At the beginning of the project an expectation questionnaire will be filled in by the participants, to better know what are the needs of those involved in the project in order to adapt our activities; at the end, a feedback questionnaire will show if we met the expectations. For the evaluation we will use:questionnaires; interviews; “face to face”discussions at project meetings and discussions between the project meetings. The evaluation will be both qualitative (p roject content, project progress, satisfaction levels and strong points) and quantitative (number of learners involved, number of teachers&trainers involved, number of media appearances etc). • a mutual evaluation in cascade,in which partner 2 will evaluate the activity of partner 1,partner 3 will evaluate partner 2 and so on, each partner being at the end of each project year assessed and evaluator in the same time and it will be an external and more reliable, objective and therefore more competent evaluation. At the end of the partnership, we will establish a valorization plan in to get feedback from each partner about the follow-up of the project (e.g. evaluation from the NA, results of new way of teaching, new European projects, activities to spread the results after the project period). -After improving their knowledge on economics, business and entrepreneurship, teachers&trainers will share their experience with their learners by approaching them and improving communication of the teaching staff, as well as improving their pedagogical work efficiency. -The teachers&trainers involved in CO-BUS-VET will become a source of inspiration for their colleagues, who will see the multiple benefits of European projects. In this way, they will find the achievement of the trained professional and educational accomplishments. - The most successful results of the project will be conducted directly in the training situation, in front of the learners who will mostly benefit from the professional progress of their teachers&trainers. -the partner from RO will organize an international symposium and will publish the best practices on a DVD with ISBN. -the web site and the newsletters will inspire everybody who might be interested in the topics to track activity on their own institution, so everybody can have the opportunity to track the progress of the project, to inspire, awaken their mimetic attitude, imitate our effort and to come up with innovative ideas.